I wouldn't delete it mate. The 2n2 and 3n3 is just a last filter to cut highs at the output and the actual audible difference will probably be negligible at best, most likely none whatsoever. You cover the most important differences. Heh. Went already. I didn't even save any backups. Just verified it, great pedal, great fuzz sounds without any muddiness! Getting feedback is easy! Thanks! HI, besides LM301AN, any other IC we can use? You could try any single opamp, however the LM301 has compensation between pins 1 and 8 and you'll want that. So options are pretty much the LM308 or NE5534. LM308, NE5534, OP07. The TL071 and LM741 should work too but they don't have compensation from pin 8 and so you can omit the 22p cap, and it may not sound exactly as intended. Forgot about OP07.. In my experience, missing compensation causes whine, oscillation and noisiness. But it may still be good thing to try everything out. For what its worth, I think the NE5534 uses pins 5 and 8 for compensation rather than 1 and 8 (its internally compensated for, so also 'shouldn't' need the cap)although I'm finding it is squeeling a tad at the top of the gain. I'll experiment with external comp - tried 33pf between 5 and 8, but it didn't have any effect. Great site guys, haven't posted before but I really appreciate the effort you guys put in. I just built this one this morning and I like it a lot. it also works great with a bass. I've tried NE5534's, OP07's, a CA3130EZ, the stock LM301AN (national semi), TL072 and an OPA277 in mine. the 5534 gets too sloppy at max gain, and the TL072 will feed back a max gain. my personal favorite is the OPA277. the stock LM301AN is also nice, especially if you're going for a little darker, more vintage fuzz/OD. can any of you guys help, I have built this to the letter and cant get any sound atall. I have done all the usual checks, component position, power across the circuit, power across the ic and beep tested all wires and all tracks across the circuit everything checks out, ive years of electronics experience and still cant work out why this wont work, any ideas? Hi John. If you're sure you've done everything from the Faults tab on top of the page, post some hi res pics to an image hosting site and paste the links here. Be sure to include pics of the component side, copper side and all off board wiring. Try to make them as clear as possible. You could also start a thread in the Debugging section on the forum and post the pics there. hi, thanx for your quick reply Ciaran, I did all the checks, there was no dry joints no shorts and every track and wire tested correctly. Ive clearly been sold crapy componants, when will I learn not to buy anything from ebay. Was supposed to be a quick easy build, so I have binned it now, thanx again for your help anyway. How does this or the moongose works before ge fuzzs? i want to use it as a splitter with a blender after in the chain so i got here searching for splitters that don't mess with the impedance sensitive old style fuzzs. 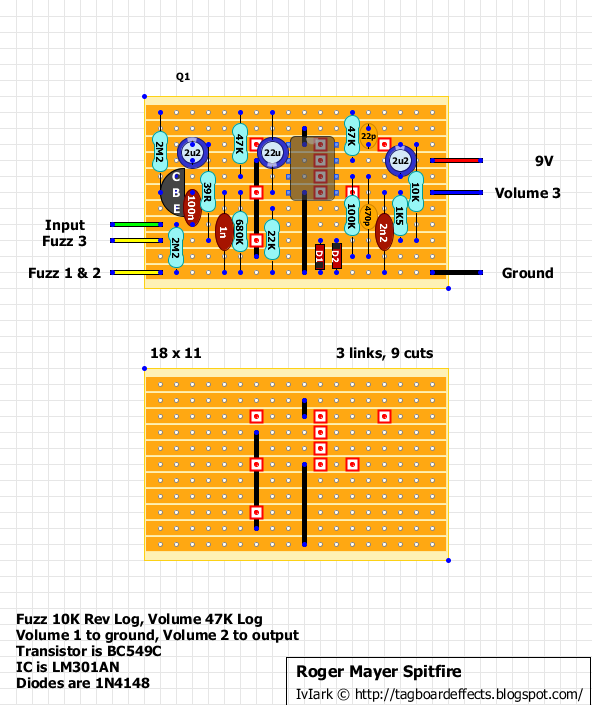 Maybe i even copy the parts i could need to just split to get parallel fuzzed signals so i can send to trebly stuff as a fuzz factory or split it again with this thing to refuzz them at different, sustain, grain and tonal textures. 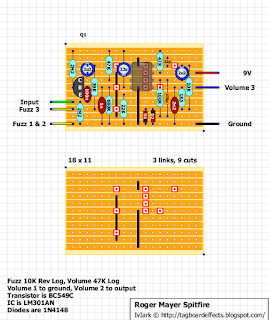 I know Roger did the axis for Hendrix as a safe for wah fuzz but i'm not sure if the outs are safe for fuzz as well. Have any of you tried to stacking this? Works the same or enough near (the splitting impedance matching) on and off?